The Higher Learning Commission, a commission of the North Central Association of colleges and schools, notified University President Barbara Dixon that the Institutional Actions Council (IAC) voted to continue the accreditation of Truman State University at its meeting June 13. The Commission Board of Trustees validated the IAC action through its validation process that concluded June 24. “Truman’s continued ten-year reaffirmation of accreditation by the Higher Learning Commission is the result of much hard work by senior administration, faculty, staff and students,” Debra Kerby, professor of accounting and self-study coordinator, said. “The reaffirmation offers confirmation that student learning and development is the focus of the University’s planning, decision-making, and educational activities. Truman hosted a team of evaluators from The Higher Learning Commission Jan. 31-Feb. 2. In preparation for this visit, about 70 Truman faculty, staff and students were engaged in a comprehensive self-study process during the 2003-2004 academic year. The University submitted an evaluative written report to the HLC in December 2004. Kerby chaired the 19-member steering committee that guided the self-study process. Five subcommittees collected, analyzed and evaluated data. The subcommittee chairs were Adam Davis, professor of English and interim director of interdisciplinary studies; Jay Bulen, associate professor of music; Doug Davenport, interim dean of social science and associate professor of justice systems; Janet Gooch, associate professor and director of communication disorders; and Karen Smith, associate professor of psychology. 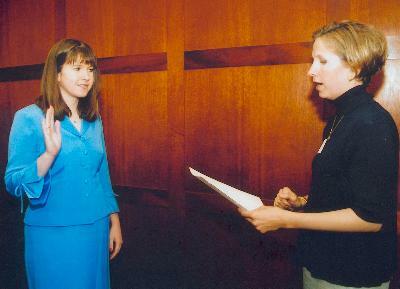 Board of Governors President Sarah Burkemper (right) swears in Emily Kiddoo (left) as the new Board of Governors student representative at the Board of Governors meeting in the Student Union Building Conference Room Aug. 5. The Board of Governors has a new member. Gov. Matt Blunt appointed Emily Kiddoo to the Board of Governors in July. Kiddoo is a sophomore political science and business double major from Memphis, Mo. She is a member of the P.E.O. Chapter C and the Truman State University College Republicans. Kiddoo is a member of the United Methodist Church. She is a recipient of the Truman Leadership Scholarship award and the Missouri Health Care Association Teen Volunteer of the Year award in 2004. Truman has been recognized by two publications recently. For the ninth year in a row, Truman State University has been recognized as the No. 1 Public University in the Midwest Region–Master’s Category by U.S. News & World Report’s “America’s Best Colleges 2006.” Truman also was ranked No. 8 overall in the Midwest region among both private and public institutions. Truman is the only public university in Missouri to be included in the top 10 public university-master’s ranking. The Midwest region category includes Illinois, Indiana, Iowa, Kansas, Michigan, Minnesota, Missouri, Nebraska, North Dakota, Ohio, South Dakota and Wisconsin. Truman State University is one of the nation’s best institutions for undergraduate education, according to The 2006 Princeton Review College Guide’s “The Best 361 Colleges.” Truman is among a select group of schools featured in the latest edition that looked at academic programs, institutional data, feedback from students at the schools, and visits to schools during the years. Opinions of independent college counselors, students and parents were also considered. Efforts were made to have a wide representation of colleges in the book by region, size, selectivity and character. Truman also ranked No. 5 in the category “Students Happy With Financial Aid.” More than 95 percent of incoming freshman receive a University scholarship and/or federal financial aid. Students interested in a part-time job this semester are encouraged to apply to work with the Tel Alumni campaign. Tel Alumni is hiring between 30-40 students to work for 12 weeks. Tel Alumni offers nightly prizes including items such as gift certificates, clothing and food; a relaxed, fun environment; paid training; a flexible schedule and an hourly wage of $5.15. Scholarship and work study positions are also available. Tel Alumni is an excellent résumé builder for students majoring in fields such as business and/or communication. For more information, go to http://truman.erecruiting.com or pick up an application in the Advancement Office, McClain Hall 100. The application deadline is Sept. 6. Contact Brad Neathery, at 785.7432 or neathery@truman.edu for more information. Students should check out the University Career Center’s eRecruiting Web site at http://truman.erecruiting.com if they are looking for a job on or off campus. eRecruiting is used by more than 500 colleges and universities across the nation to address their recruiting needs. Truman uses eRecruiting for students and alumni to find opportunities both on and off campus, internships, co-ops and careers when they leave Truman. eRecruiting provides students with a centralized location on the Web to find on-campus job opportunities for student work including scholarship, institutional and volunteer positions. From associate professor to professor: Jacqueline Collett, music; David Conner, psychology; Cynthia Cooper, biology; Adam Davis, English; Scott Fouch, accounting; John Hoffman, education; Patrick Lobert, French; Christopher Maglio, counseling; Joan Mather, theatre; Judith Misale, psychology; Sherri Palmer, psychology; Terry Palmer, psychology; and Donna Rhinesmith, education. From assistant professor to associate professor: Scott Alberts, mathematics; Matthew Beaky, physics; Dale Blesz, special education; Michael Bump, music; Scott Burt, biology; Dereck Daschke, philosophy and religion; Danion Doman, Spanish; Taner Edis, physics; David Garth, mathematics; Martin Jayne, justice systems; Jennifer Jesse, philosophy and religion; Priya Kambli, art; Peter Kelly, special education; Hyun-Joo Kim, mathematics; Andrew Klyukovski, communication; Alexander Koch, exercise science; Joaquin Maldonado-Class, Spanish; Marie Orton, Italian; Pamela Ryan, mathematics; Scott Thatcher, mathematics; Juan Carlos Valencia, Spanish; and Albert Weitz, communication. Those people riding bikes on the Truman campus may have noticed changes in where they can park their bike. Students can apply for internships in the Washington Center Program for either the spring or summer semesters 2006. An application deadline of Sept. 15 has been set to meet the competitive deadline for spring 2006 and the security clearance deadline for summer 2006, according to campus liaison Diane Tobin Johnson, assistant professor of communication. Students who wish to apply to intern in summer 2006 for the U.S. Attorney’s Office, the U.S. Department of Defense, the U.S. Department of Justice, the U.S. Department of State, and the U.S. Department of Homeland Security must meet the security clearance deadline. Students who wish to compete for placements for spring 2006 with CNN, the U.S. Environmental Protection Agency, The White House, and certain government agencies must meet the competitive deadline to compete for stipends and awards in various leadership and government programs. Students from any major can apply for this program and are invited to attend an informational meeting and/or application workshop. The application workshops will take place in a classroom with computer access so that students can actually work on their applications. Informational meetings will take place at 7 p.m., Sept. 1, in Baldwin Hall 262 and at 7 p.m., Sept. 6, in Baldwin Hall 249. Application workshops will take place at 3:30 p.m., Sept. 9, in Baldwin Hall 351 and at 9 a.m., Sept. 13, in Baldwin Hall 351. For additional information about the program, including projected costs, consult the Washington Center Web site, http://www.twc.edu or contact Johnson at djohnson@truman.edu or 785.7852. Due to construction delays in Magruder Hall, many science classes have been assigned to different rooms. Students should check their schedule via TruView for the correct room assignment. Please join us as we honor and say thank you to Kathy Rieck for her many years of dedicated service to Truman State University. Sponsored by the Center for Student Involvement and Cardinal Key. The rain site will be the Student Union Building. Free add/drop for full-term and first block courses ends at 11:59 p.m Sept. 2. Students may add and drop courses via TruView or make changes in person in the Registrar’s Office between 8 a.m.-5 p.m. New freshmen and new transfer students will need to obtain their RAC code from their academic adviser to make schedule changes. Returning students will not need a RAC to make changes to their schedules. A $50 add/drop fee will be assessed for any schedule change made after the free add/drop period ends. Returning students who completed courses at other colleges or universities during the summer semester need to send official transcripts for this work to the Registrar’s Office by Sept. 30. Students who have already sent a transcript to Truman, should check their transcript on TruView to be sure that this credit appears correctly on their records. The tentative spring 2006 schedule is now available via TruView. To view the schedules, select “search open course list” from either the student or the faculty tab. Graduation applications for undergraduates who want to graduate in May 2006 are due in the Registrar’s Office by Sept. 9. Applications and degree worksheets are available at http://registrar.truman.edu. The tentative Spring 2006 schedule is available via the TruView open course list to help students complete their application. December 2005 Undergraduate Degree Candidates: If you have made any changes in your course schedule(s) since you submitted your graduation application and have not yet updated your application with the Registrar’s Office, you need to do so immediately. Updates can be made in the Registrar’s Office, McClain Hall 104, Monday through Friday between 8 a.m.-5 p.m. You do not need to complete a new application. To remain on the graduation list, all changes to your degree plan and all required substitutions must be on file in the Registrar’s Office no later than Sept. 30. Check out the online Master Calendar at http://calendar.truman.edu for additional events on campus. Maureen Bylina, a senior health science major from Chicago, has been honored with the Eta Sigma Gamma National Professional Health Science Honorary Founder’s Scholarship Award. The award will be presented at the Annual Meeting of Eta Sigma Gamma during the American School Health Association National Conference in Burbank, Calif., on Oct. 21. Taner Edis, associate professor of physics, together with Amy Bix, published the paper “Biology and ‘Created Nature’” Gender and the Body in Popular Islamic Literature from Modern Turkey and the West” in the Arab Studies Journal 12:2/13:1 140 (2005). John Ishiyama, professor of political science and McNair Program Director, had his article “Globalization and the Formerly Dominant Communist Parties in Central and Eastern Europe” published in the journal Globalization. In addition his article “The Former Marxist Leninist Parties in Africa after the End of the Cold War” has been accepted for publication in the journal Acta Politica. Barry C. Poyner, professor of communication, had an entry on “James Shannon” published in The Encyclopedia of the Stone-Campbell Movement (Eerdmans Publishing Co., 2004). Poyner’s earlier work on Shannon is still in print, Bound to Slavery: James Shannon and the Restoration Movement (Star Bible, 1999). This semester Poyner is on sabbatical researching the life of Emily Tubman, wealthy and independent southern philanthropist, who freed her slaves and accompanied them to Liberia. A descendent of the Tubman slaves became president of Liberia. Gregg Siewert, professor of French, attended the American Association of Teachers of French annual convention in Québec, Canada, July 7-10. In addition to presenting a session on contemporary French song lyrics to 48 conferees, he earned first prize in the teachers’ oral dictation contest, and was awarded a copy of the 2005 edition of the Petit Larousse dictionary. About 90 teachers wrote the dictation, but only 46 turned in their copies for evaluation. Siewert was invited to submit a chapter on sport in contemporary France for a volume on French civilization to appear in late 2007. He was able to have dinner with four of the six Truman undergraduates who were studying at U. Laval this July-August. The Child Development Center (CDC) at Truman State University has added a new Monday, Wednesday and Friday (MWF) half-day preschool program. The new MWF half-time program’s schedule will be from 7:15-11: 15 a.m. or 1:30-5:30 p.m. Tuition rates for this program are competitive with community tuition rates. If interested, call the CDC’s Head Teacher Heather Rohn at 785.4473 or the CDC Director Jo Agnew-Tally at 349.0032. As part of the You Drink & Drive. You Lose. National Crackdown, the Department of Public Safety (DPS) is currently working with other local agencies to protect people from impaired drivers until Sept. 5. DPS officers will be conducting patrols throughout the University community. The University Art Gallery at Truman presents two exhibits until Sept. 30. A solo exhibit of Jo Stealey’s work is on display in the Spotlight (side) Gallery. A public reception will take place at 6 p.m., Sept. 12, at the University Art Gallery. An art faculty exhibit, “The Truman Show,” is on display in the gallery. A public reception will take place at 6 p.m., Sept. 19, at the University Art Gallery. Contact Aaron Fine at 785.5386 for more information. Over the summer as part of the Summer Reading Program, Student Senate and the Residential College Program invited all members of the Truman community to read “War is a Force That Gives Us Meaning” by Chris Hedges (First Anchor Books, 2002) and/or “Betsey Brown” by Ntozake Shange (Picador, 1985). There will be a discussion of these books at 7 p.m., Aug. 31 and Sept. 1, in the Student Union Building Georgian Room. They will discuss “War is a Force That Gives Us Meaning” on Aug. 31 and they will discuss “Betsey Brown” on Sept. 1. The Writing Center, located in McClain Hall 303, will be open for consultations beginning Sept. 6. The Writing Center hours will be announced at a later date. The Center for Teaching and Learning will launch its Weekly Lunch Series for faculty, teaching staff and GTRAs with reports from the 2004-2005 E-Fellows at 12:30-1:30 p.m., Sept. 7, in the SUB Spanish Room. Participants may receive $3.00 toward their Sodexho meal by signing the attendance sheet at any of the Student Union checkout counters. Contact the Center for Teaching and Learning at 785.4477 for more information. The Observatory will be open to the public weather permitting from 8:30-10:30 p.m., Sept. 8, at the University Farm. Go to http://observatory.truman.edu for additional information. The AAUP will meet at 4:30 p.m., Sept. 9, at the University Club. Contact Marc Becker at 785.6036 for more information. The Brashear Elementary After-School Program is looking for Truman students, faculty, staff and organizations to share their knowledge and talents with the elementary students. This may be done through hands-on activities, displays, interactive presentations, performances, or any type of creative methods. This can be a one-time event, sequence of events or scheduled on a regular basis. Contact campus liaison Colleen McLaughlin at colleen_mclaughlin@brashear.k12.mo.us for more information.